Very funny! I've never seen anything like it, but it sure looks interesting! Going Green in a new kind of way! The thing that made this such a pain to put together is you have hundreds of little pieces you have to push together with your thumbs and by the end of it your thumbs are black and blue. But what made it fun was getting Pierce involved in putting together the stuff he could handle. The nice thing about this E composter is it rolls on its stand so it's super easy to turn the stuff inside. It has two sizes of doors on both sides of the ball (so four doors total) for easy loading and unloading, definitely overkill but appreciative to have. 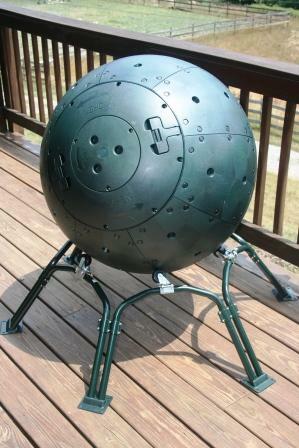 It also doubles as a Paul Bunyan sized bowling ball or a manly man's yoga ball. This really looks like the Death Star. Thanks for stopping by. When I first saw the picture, I wasn't sure if it was a space ship or cannon ball! I'm glad it's finally put together so you can put it to good use. How interesting.. Glad it wasn't too hard for your hubby to put together.